In a very famous animated movie we saw a clown fish living in a sea anemone. This is a true fact about this funny fish. The anemone protects the clown fish from its predators and the fish saves the anemone from parasites. But what that movie got wrong is that clown fish are hilarious. They do tell the best jokes. 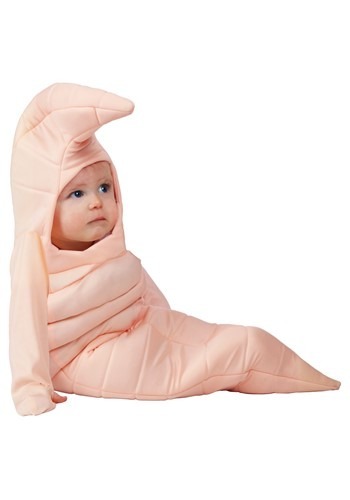 No doubt when your baby is in this costume you'll get a good giggle! She can dance the afternoon hours with Hyacinth Hippo from Disney's Fantasia in this Baby Hippo Jumpsuit Costume! It's warm & cozy for a chilly Halloween night, and also provides easy access for diaper changing. Now you can get ready for the night like a real nocturnal animal in this Bat Pajama Costume! While most western cultures consider bats to be symbols of death and disease, the Kwakiutl, Chinese and Macedonian peoples consider them symbols of good luck and longevity. Some Native American tribes consider them to be trickster spirits. Share these fun facts with your friends when you wear this costume! What's cuter than a sleeping puppy? Your child taking a nap in this Bentley the Puppy Infant Costume! Its as soft, cuddly and cozy as any baby could want. It's also as cute as any doting mom could want. Your young wildlife enthusiast will enjoy wearing this Brown Moose Face Hoodie to keep warm while hiking in the woods. Even if you don't live in an area where you might see a real moose, it's fun to imagine meeting one. Did you know that the moose it the largest living species of the deer family? This Casey the Caterpillar Newborn Bunting will keep any baby snug and comfortable. Not to mention cute, too! Someday she'll become a butterfly. But for now, this bunting makes a perfect cocoon. When you walk around the desert you'll meet some interesting characters. One character you just might meet is the camel. This crazy mammal loves to walk around the hot sands catching some warm sun rays. But what happens when he runs out of water? He can keep himself going by the awesome hump he has on this back! 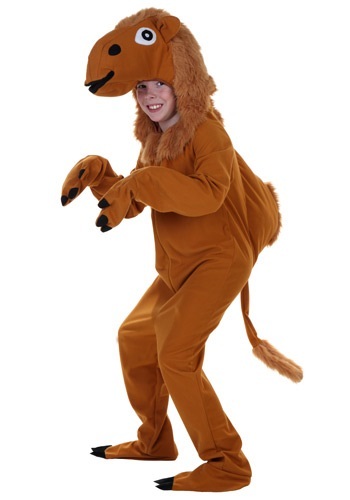 So if your child wants to be an adorable desert animal, this Child Camel Costume is just the thing! There's an old song that advises, "Never smile at a crocodile." 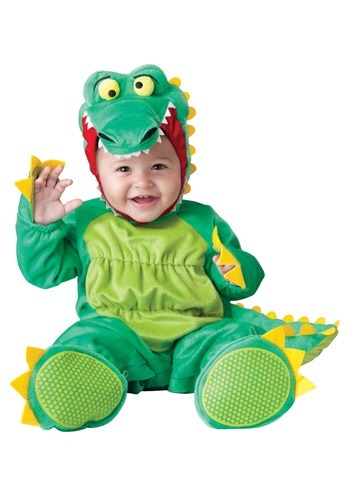 Well, nobody will be able to follow that advice when your child wears this Child Crocodile Costume! "Cute" and "cuddly" aren't usually words we think of for reptiles, but there's an exception to every rule. Who knew that a giant lizard could be this adorable? Got crocodile? 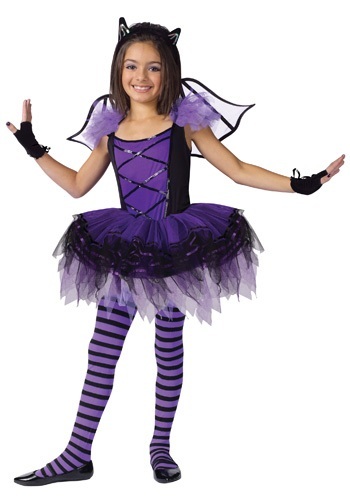 There's lots of different dances your child will be able to do in this costume. The mamba, the waltz, and of course the crocodile rock! Whether they intend on dancing or not, they'll enjoy a turn as this famous reptile. 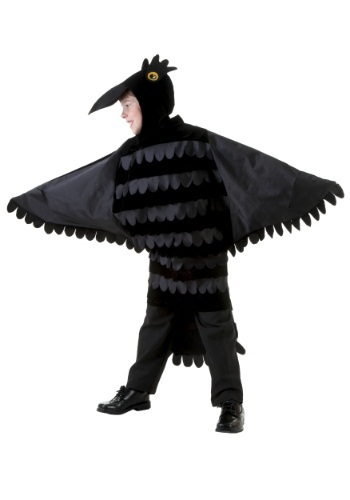 Calling your kid a bird brain isn't so bad, especially when he's wearing this kids crow costume. In fact, crows are actually the Einsteins of the bird world and all the other birds are secretly jealous of how smart they are. So, when you call your kid a bird brain, it actually means he's one smart little dude! What's the cutest creature in all the animal world? Move over Slow Loris, because there's a new cutest in town. 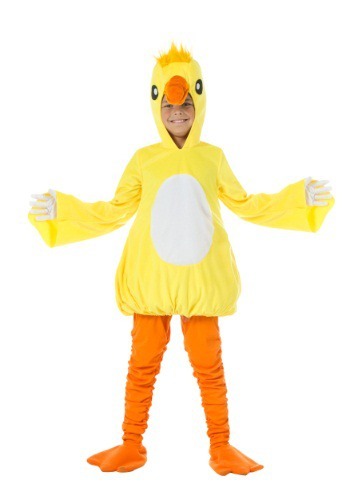 This child duck costume! Keep him in the tub, keep him in the yard with a little pond, or keep him close so you can hear him quack all day long as you toss him bread. Yep, we think this costume is absolutely quackers and any fan of adorable things will be pleased. Let your little one take to the skies as the majestic bird know as the eagle. 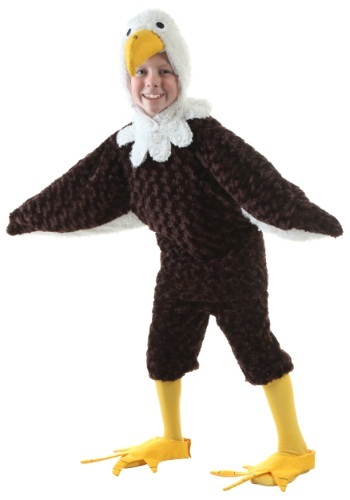 With this great animal costume they will feel one with the birds when they wear this outfit. Be sure to pick up some yellow tights to be worn under the pants to complete the total bird look. Worms have plenty of ways to have fun. Sometimes they wiggle. Sometimes they wriggle. Other times, they flop around in the dirt. You kid is already great at all of those things, so maybe it's about time to let his inner worm shine this year! 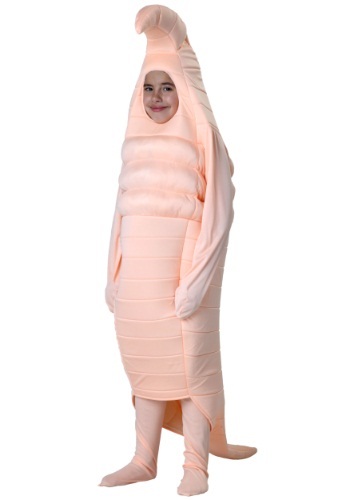 This Child Earthworm Costume might just let his true nature shine. When you go on a jungle safari you may come across a wild animal in the water. This animal is called a hippo and he loves to just hang out in the river watching the other animals run around searching for food. But the wise hippo knows that if he just hangs out long enough he'll have food and goodies thrown to him. This Halloween your hungry little hippo will no doubt get the most candy in this great animal costume. 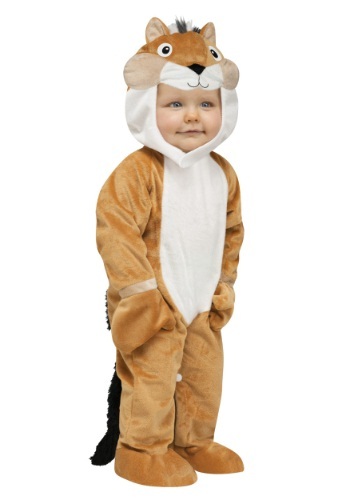 Any child who enjoys nature will love this Child Koala Costume! It's fun for Halloween or for a zoo or Outback-themed party. Did you know that zebras communicated with facial expressions and sounds? When their ears are flat back, you'd better watch out! Transform your child into her favorite sassy and unique zebra with this Child Little Zebra Costume. Let your child become a large and in charge animal of the forest when they wear this adorable moose costume. They'll feel just like the antlered animal when they wear this outfit as they go trick or treating. 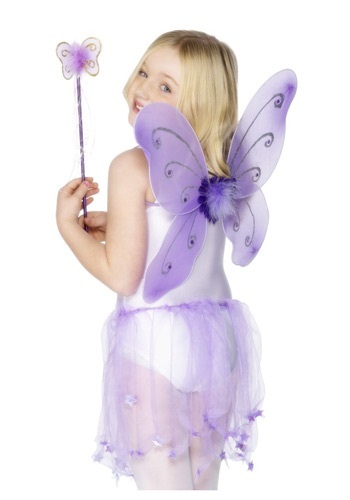 This Child Purple Butterfly Wings Kit isn't just for butterflies! It can also work as a fairy costume accessory. Great for Halloween or for everyday dress-up play. Oh no! It looks as if Little Bo Beep has lost her sheep... and the cutest one in the flock at that! 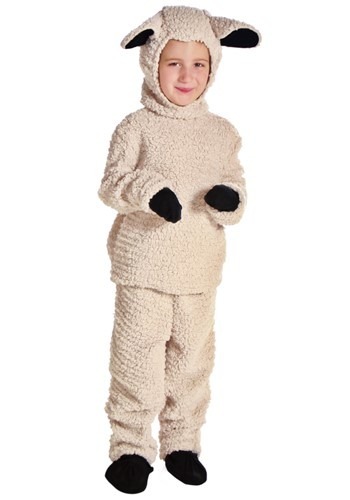 Wear this Child Sheep Costume and try to get back to Little Bo Peep because she is worried about you. This costume looks great when paired with other farm animal costumes. 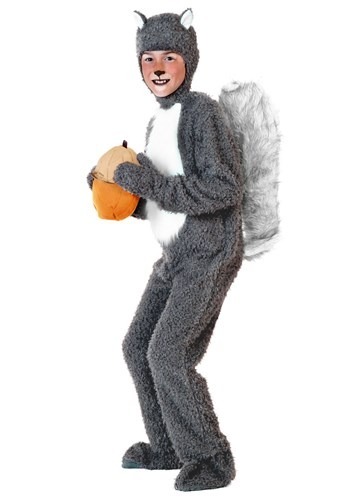 A child who likes to squirrel things away might enjoy wearing this Child Squirrel Costume! It even comes with an acorn to start the collection. Add animal makeup to make the look even more authentic, and then warn your child to beware of dogs while trick-or-treating! Zebras are truly magnificent animals. These creatures roam the African plains eating all the grass they want. But sometimes there are lions that may stalk these black and white creatures which means the Zebras will have to get clever. They will run off into the tall grass and be able to trick those kings of the jungle because their stripes will make them lost. Now your little girl can pretend to be the most adorable horse of the jungle in this outfit. How many chipmunk friends do you have? Unless you're a cartoon princess in a movie, probably not many. That is about to change! Once your child wears this chipmunk costume, you can go around town boasting that you are friends with the cutest chipmunk on the block. 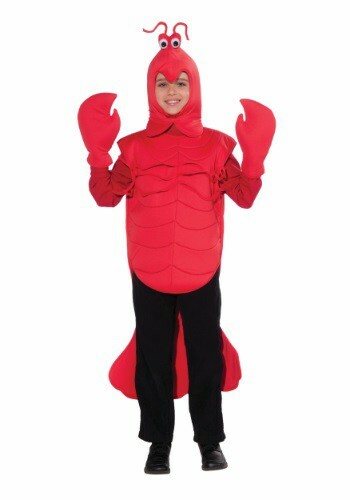 Or you could just take your little one to a costume party in it, where he'll be the most adorable thing around. Any mama bear knows that their own cub is the most cuddly creature in the known universe. And we bet you and your little "cub" are no different! Sure, you might have a human child, but when you get them in this cuddly bear infant costume they'll instantly become so soft and cuddly that you'll have trouble even putting them down to take a picture. 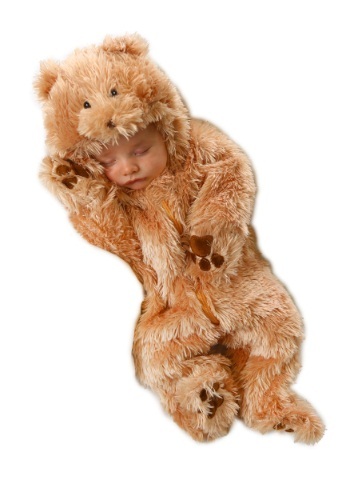 Whether for Halloween or just a bit of fun, this cuddly bear costume will be "bear-y" memorable! This Australian icon is ready to attend the Halloween party down under in this Cute Child Koala Costume! But, did you know that there's no such thing as a "koala bear?" That's because koalas AREN'T bears, and aren't even related to bears! They do sort of look like bears, but not any more than raccoons do. And raccoons ARE related to bears. He might be small, but you always knew your baby was a lurking predator! He might lack the reptilian skin and the glazed eyes of a prehistoric hunter, but that' going to change when he wears this alligator costume! Okay, so maybe it will just make him goofy and adorable, but that's just as good as having an aquatic predator for a kid. The wild hippopotamus is one of the most dangerous animals to come across on a safari. The baby wearing this purple hippo costume, however, only runs the danger of being too cute for it's own good! It's super soft too, so you don't have to be afraid to cuddle up with your little one. 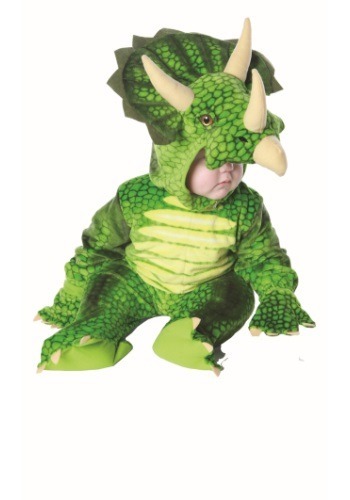 You might not be able to create your own dinosaur theme park by dressing your little one up in this Infant / Toddler Triceratops Costume, but he will still be pretty adorable. Your only other option is to collect fossilized amber with a mosquito trapped inside and splice the DNA inside with a frog's and that's not nearly as fun as it sounds. Let your little girl become a fairy or a mermaid in this Infant Blue/Green Tutu Costume. Or give her a head start on a dancing career. Either way, she'll be adorable! Maintaining a saltwater aquarium is pretty hard. You have to constantly check pH and salinity levels all the time, and you have to clean the tank every week. We found a much better way to fill your home with cute aquatic life. 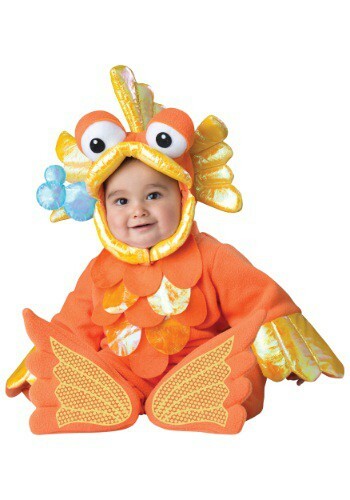 Just wriggle your little cutie into this clownfish costume and have them dance around your living room. It's like having your own giant aquarium in your living room! Deep under the ocean there is a creature that crawls around the coral with his eight legs, the Octopus. This sea animal is special because it has no skeleton and loves to hang out with his fellow fish friends. Now your tiny tot can swim around ocean in this adorable costume. 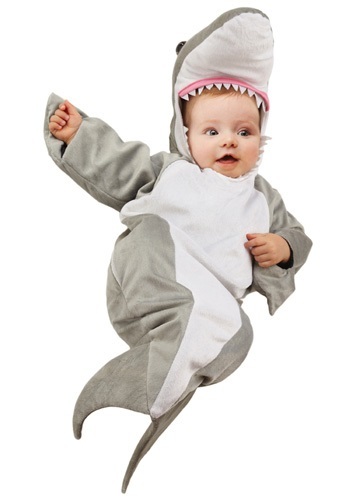 Although this infant bunting turns your little one in the most adorable little shark to terrorize a beach, most parents just can't help but say something like, "We're going to need a bigger boat!" after they see him. 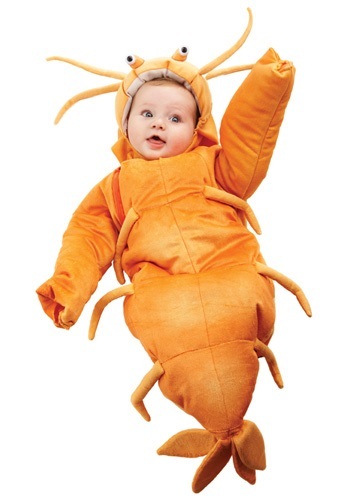 You could serve a bunch of h'orderves at your party, or you could just dress up your child as a little shrimp. It might not actually solve your problem of what to feed your guests, but he will look cute enough to eat...with cocktail sauce. Actually, it might be better to warn your guests that your little one isn't on the menu for the evening! "Oh, sweet Dragonfly, just fly and magic will always be at your wingtips." Suit your little one up with this adorable Dinky Dragonfly costume, and they're sure to be the cutest costumed tot that anyone has ever laid eyes on. And with the supersized eyes on this endearing costume, they'll be ready to stare right back! Outfit your child with this costume look for a magical time. 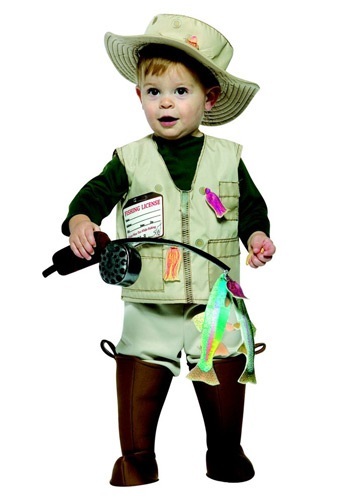 Give your child a head start on practicing his fish tales when you dress him in this Infant/Toddler Future Fisherman Costume! It comes with everything he needs to look like a seasoned angler--even a printed felt fishing license sewn to the vest. What sound does a goldfish make? Hmm, that's a good question actually! We'd like to think that goldfish make a noise that sounds like 'blub blub blub.' Dress your golden boy or girl as a tiny bubble-eyed goldfish. He already out grew his bowl but he's still too little for the great big sea. This giggly goldfish costume will turn your little cutie into quite the catch! Give your little one a chance to become a giant legend with this Kids Blue Ox costume. They'll look just like Paul Bunyan's favorite pet Babe when they wear this adorable outfit. Now your child can hang out with his pals in this cute Kids Hamster Pajama Costume! It's perfect for a Halloween sleepover party, or for anytime fun! If your child likes the animé Hamtaro, get this costume! Did you know that a zebra's stripes are as unique to each individual animal as a human's fingerprint? And that they are black with white stripes, not the other way around? (How do they know this? From studying zebra embryos. Before they're born they start out black, and the white stripes develop later.) Dress your child in this Kids Zebra Costume, and see what other fascinating zebra facts he can learn! Contrary to popular belief, most turtles don't fight evil ninjas for the good of mankind and they usually don't race against hares. Most turtles like to just chill by the water and relax. If that sounds like your baby, the cool, nonchalant kind of little dude, then he'll feel right at home dressed up in this turtle outfit. It's a moose sighting! It's a little bitty moose who will grow up one day to be a great big majestic moose! This Marley the Moose Costume is a soft and plush jumpsuit that both little boys and girls will love to wear this cozy costume. Who says wild animals can't be feminine? This Teen Zebra Costume lets you do that. Wear it with pink or black tights and shoes for a fun look. Fun zebra fact: did you know that a zebra stripes are unique to each individual? A zebra's stripes are like a human's fingerprint! The best part about having a baby octopus is that there's even more arms to be hugged with! That and how helpful they'll be around the house once they're a little older ... 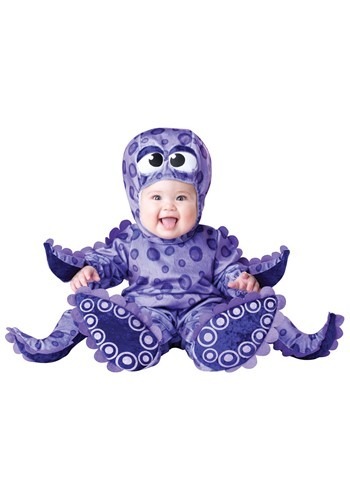 When your child looks super adorable in this Tiny Tentacles Octupus Costume, that's just what you're going to want: lots of cuddles and hugs.